Moonrush - Universe Galaxies And Stars Section. 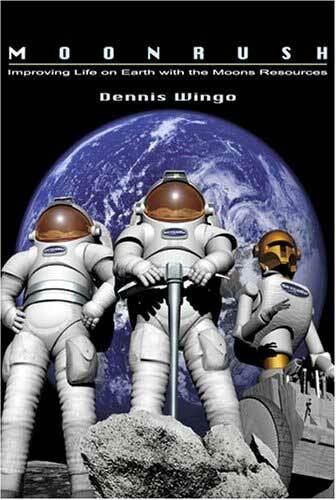 Last week, Mark Mortimer reviewed Dennis Wingo's new book, Moonrush - Improving Life on Earth with the Moon's Resources, about the prospects of getting our future materials from space. Well, we had a few more questions for Wingo, about property rights, related projects here on Earth, and the possibility that we could wreck our environment so badly that getting into space is totally out of reach. Read on for this bonus interview with Dennis Wingo. Let's assume the money is available and a CISLunar economy is beginning. Where would your job be? Phase II is the development of in-situ resource extraction technology for oxygen, water, and valuable metals such as the Platinum Group metals described in the book. The "waste metals" such as iron, nickel, cobalt, would be used to build up infrastructure on the Moon such as large habitation structures, railroads, power distribution networks, and the like. In phase II we would also develop large heavy lift launch vehicles that would cycle from the Moon's surface to L1. The amazing thing about President Bush's announcement on January 14, 2004 was his putting forth the idea of vehicles built on the Moon that would carry us to Mars. If I build a launch vehicle there I am unencumbered with the requirement to make the launch vehicle look like a pencil. How would you set property rights for Earth's moon. Property rights are a difficult subject that brings out heavy emotions on all sides. I would rather do something like establish lease rights for resource utilization on the Moon and then set up open bases that would be available for all who want to use it in favorable locations. There is this idea in the U.N. Outer space treaty that the Moon is the common heritage of all mankind. Well I agree with that, so is the Earth. That does not preclude the use of the Moon's resources by folks here on the Earth and there is no way that anyone looking at the problem can make a statement that governments are more capable at extracting those resources than private enterprise. It is funny in a way as over the long term resources are not the greatest value asset on the Moon, there are much more resources in the asteroid belt. The Moon and its environs will be a manufacturing center. Who owns the free space between the Earth and Moon? That is where the long term value places are. The value of the Moon is its time cost of money for the near term. It should be intuitively obvious to the casual observer that the Moon, being three days away, is a more cost effective place to extract resources in the near term than the Near Earth asteroids (NEA's). However, that being said, the NEA's are going to be the much more overall cost effective locations, but only after the infrastructure gets started on the Moon as I described in your first question. I am very certain that we are going to be using Phobos and Deimos as well, both for resources and as a location for a very large base of operations to support Martian development. So, after giving you a long winded answer I expect that it will take less than a decade to do this, again after the Cis-Lunar portion of the economy gets on sound footing. Will there be a point that we've wrecked our environment and we're too late to start mining space? That is a dang good question. The only thing lacking today to do mining in space, on the Moon, the NEA's and elsewhere is will. We have the technology, we have the capital, we just don't seem to be able to get our act together to do it. I think that the reason is that for the last 30 years the guys holding the purse strings have been scientists, concerned with the science value of our nearby celestial orbs. While I am completely supportive of science, science is an inadequate justification for a large scale move into space. It has to be economics. We have it within our power to, within 50 years, to completely eliminate most mining on the Earth, not by legislation but by competition with the much more plentiful resources that are out there waiting to be taken. We have the technical ability to do this and it would be an incredible boon to the terrestrial environment. The World Wildlife Federation just this past week came out with yet another proclamation that we are using more resources from the Earth than is sustainable. Well they should be our greatest supporters because the scale of resource available just between here and Jupiter is billions of times greater than we could possibly use, even with a much larger population than we have today. We do not have a problem with resources. We have a problem of a lack of vision by those in government and in the environmental movement to look at the issues in different ways than has been the norm in the past. The reason for this in the environmental movement is that they are wedded to the central tenant of the "Limits to Growth" that there are no technical solutions to our problem. This is manifestly untrue but is an axiom in those circles. Another reason is that the "space" community, lack the passion of the environmentalist in putting forward our solutions, and rounding up the cash to make it happen. However, I do see hopes out there today that this is changing, and I am doing my part to help. So in the end my answer is that it is up to us and that we do not have to get to that point and we will not unless we are incredibly stupid. Knowing what you know now but putting yourself in the place of President Kennedy, what if anything would you do differently regarding the 1960's space initiative. That is easy, I would have cut off the stupid arguments between the different architectures that went on between Von Braun and Gilruth and went with Von Braun's Earth orbit Rendezvous method of going to the Moon. The Saturn I's and IB's were in production and flying by 1965 and had the lift capacity of a Delta IV to LEO. The Saturn V with a Skylab type station could have put into place the LEO infrastructure to enable the original Von Braun architecture as outlined in the famous Collier's articles in the early 1950's to have happened and the world would be a different place today. It was only in late 1962 that Von Braun caved in order to get us to the Moon by any method, that caused the screw up that has placed out entire civilization at risk by that one decision to abandon the build up in LEO infrastructure. Von Braun saw this in 1962 but knew that we had to beat the Russians and in the end, while we beat the Russians then, we are being beat today by the energy crisis that could end up engulfing the entire world in war. A heck of a bargain. Actually I am very hopeful. It is amazing that president Bush not only mentioned using the resources of the Moon for fuel but also the construction of spaceships there. Even Kennedy did not have that wide ranging of a vision. In execution so far it has been uneven. In February of this year, not long after the president's announcement, former Congressman Robert Walker spoke at STAIF, a conference in Albuquerque New Mexico about the danger that the "stovepipes" of existing interests within NASA would kill this initiative just as they killed the earlier president Bush's initiative. He is being proven right in this regard. I truly think that NASA headquarters "gets it" and is trying to do the right thing. The same cannot be said of some of the NASA centers. I ask each and every NASA employee and contractor who thinks that protecting their existing job is the most important thing in the world to ask themselves that is that more important than our collective future? NASA has a choice before it today. There is an old saying that goes "lead, follow, or get the hell out of the way". Well today there is some great leadership at headquarters and in isolated pockets at the centers. Some are ready to follow just to survive and the rest need to get the hell out of the way. We cannot go to the Moon or anywhere else with the current NASA/contractor infrastructure inherited from decades of organic growth. O'Keefe knows this, and the defense department knows this as well. It is going to take pressure from inside and outside to make this happen. Burt Rutan fired off the first shot in this new battle. We need those people like Paul Allen, Jeff Bezos, Elon Musk, Robert Bigelow, and Walt Anderson who have the passion and the financial wherewithal to provide the competitive pressure on the existing system. Mr. O'Keefe and Craig Steidle and the people around them are liberating some funds to support the alt.space community as well. NASA has a chance to help make this happen the right way. I hope that each and every morning these guys get up and think that the future of civilization depends on them doing this right. I know that many of us out here think that way. Again, I am very hopeful that we will make this happen.